I don’t have much else to say about my December sales, except thank you. Thank you! B&N sales are tricky because Yesterday & Today’s sales aren’t included in the monthly total, so I tried to put the three spread sheet things together as best I could. Smashwords has reported some sales from November, which I subtracted off of the total. But they’ve only reported sales from Barnes & Noble through 12/25, and I know I’ve sold books through them in the last 5 days. So this number is actually a bit low. 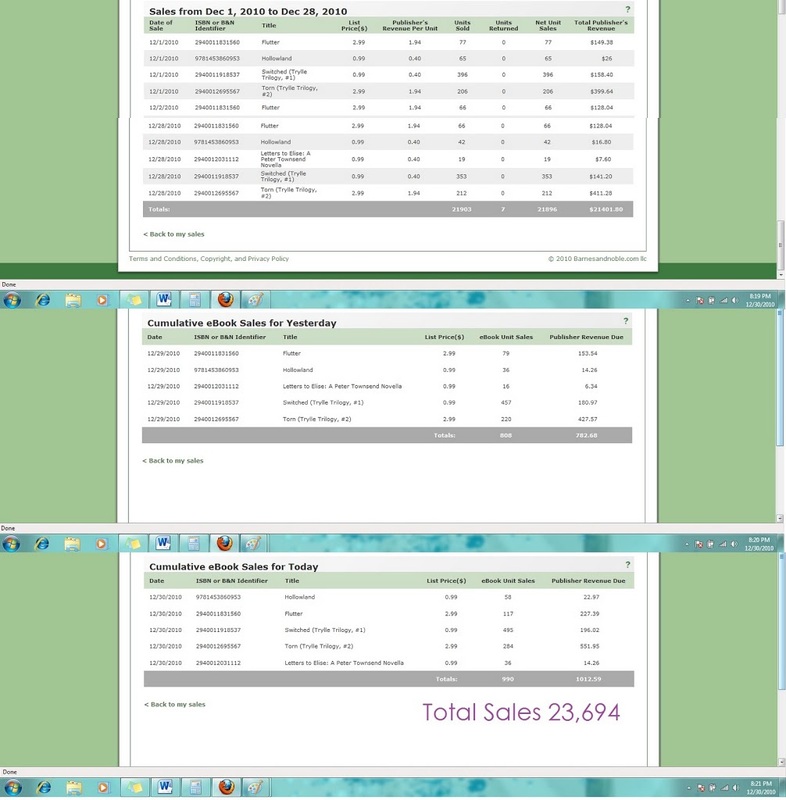 My total sales for the month of December as of 8:30 PM, 12/30/10 are an absurdly even 99,000. Can’t wait to see January’s sales, I hear they’re good. Congratulations, you rock! WOW!!!! 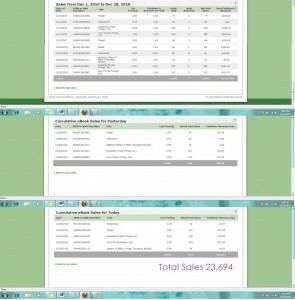 just looked at your figures..OMG!! That is amazing. Amazing. Every writers dream. Huge congratulations, Amanda! You’re a star. ugh. wow. I just saw you say on Kindle Boards you’d sold 99,000 BOOKS in December, not that you had made $99,000 (though even then that’s like 2 or 3 teacher’s salaries in a month.) I had such a hard time conceptualizing that amount of money in one month the first time that I sounded like a big moron. Wow. Thank you for sharing this. Keeps us unpublished writers motivated to keep going and hoping. Congratulations! This is exciting. It’s just awesome to see an indie author doing so well! Congrats! Hope your 2011 is even better! Posts like this are what keep me going when I check my amazon sales and see only 2 new books sold all day. I tell myself that people ARE doing this and selling novels and someday it will click into gear for me as well. Huge congratulations. I hope the stress levels out a bit for you, too. Congrats, again!! You are an inspiration!! Here’s to an even better 2011!